10m Long VGA Cable. Fully 15 pin wired. Our range on Super VGA cables are constructed using UL2919 approved 28awg triple mini coaxial and 4x 28awg conductor cables, this allows them to be used for extended distances. Triple shielded with copper braid, foil and drain wire. Dual ferrite suppressors (Barrel shaped coils on each end of the cable). 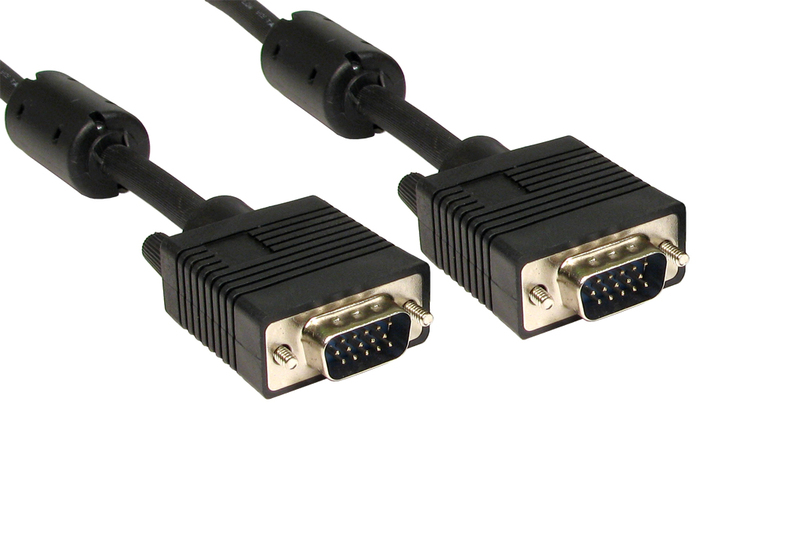 Our cables are designed for standard monitors and widescreen LCD’s that require DDC cable. SVGA Monitor Cable HD15 Male - Male Moulded 10 Mtr Black All pins connected Impendence : 75+/-5 ohm DC resistance : 237 ohm /KM MAX Capacitance : 60pF/M Attenuation : 1-100MHZ. We have this cable in lengths from 2m to 30m as well as a large range of other VGA cables. Click here for our full range.